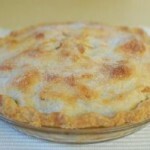 This Short-Cut Pie Crust recipe is light and flaky and makes 2 pie crusts. Stir dry ingredients together. Add milk and oil all at once. Stir with a fork until evenly moistened. Shape into a ball and cut in half. Lightly dampen a smooth work surface so that a square sheet of wax paper will stick. Place one half of dough on paper, place second sheet of paper on top and flatten dough with hand. Roll from center of dough towards edges until dough is an even thickness (about ⅛ inch) and about 1 inch wider than diameter of pie dish. Remove top sheet of wax paper. Lift by holding bottom sheet and invert over dish. Gently lift and set dough firmly against dish, smoothing any air bubbles. Save scraps that might tear from edges for patching later. After you add your filling roll second crust and invert over filling. Pinch and roll top and bottom edges together, tucking firmly onto rim of dish. If dough cracks, mend by pressing together or adding a scrap of dough. Cut vents in top for steam to escape. 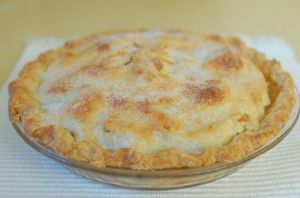 For a slightly crunchier sweet crust, brush lightly with milk and dust with granulated sugar. Bake at 400°F about 1 hour until golden brown and your filling is bubbly.